At Alzheimer’s Research UK, we’re committed to funding the most innovative grass-roots research and translating promising discoveries into benefits for people with dementia as quickly as possible. At the Alzheimer’s Research UK Conference 2016 in Manchester this week we’ve been hearing about some of the latest emerging research from across the UK. We read headlines almost every day about potential new drugs on the horizon for diseases like Alzheimer’s but sadly no new drug treatments have been licenced for the disease since 2002. Much recent attention has been focused on drugs that target one of the hallmark Alzheimer’s proteins in the brain called amyloid. Dr Mike O’Neill from the pharmaceutical company Eli Lilly presented an overview of current drug development approaches. In recent years several clinical trials of drugs against the amyloid protein have sadly not made it to treatments in people’s hands. It’s important we learn from these trials to help shape better approaches to test future treatments. Dr O’Neill told the room that one of the most important things researchers need in order to test new drugs in the most robust way, is better methods to track the disease they’re trying to treat. The final stages of clinical trials (called phase III trials) are large studies with thousands of people and can provide a final green light for a new treatment to be considered for use in patients. It’s critical that these studies are well designed and that researchers can accurately test the potential impact of that treatment on the disease. This could be through brain scans or blood tests, which can give a clear read-out of whether the drug is altering the course of the disease. This will give these long and expensive trials the very best chance of success. Research to develop these so-called ‘biomarkers’ of diseases like Alzheimer’s are already underway and you can read about efforts to discover biomarkers of frontotemporal dementia in yesterday’s blog ‘What happens in the brain in dementia?’. He also spoke about the growing attention turning to the tau protein – a second protein implicated in Alzheimer’s disease, as well as in frontotemporal dementia. The protein made the news last week as US researchers were able to use sophisticated PET brain scans to track the build-up of tau in the brain in living people both with and without Alzheimer’s. This will be an important string to the bow for researchers in tracking the impact of new treatments aiming to block tau in the brain. Drug discovery is a long process and involves many rounds of testing, ruling out and refining. When researchers discover a promising protein or molecule that plays a part in a disease like Alzheimer’s, the next challenge is to develop ways to alter how that protein works to see whether it could slow or stop the disease. Researchers are developing many innovative ways to do this. We heard from Dr Zam Cadar at the University of Oxford and Dr Rick Livesey, who leads the Alzheimer’s Research UK Stem Cell Research Centre in Cambridge. Both are using cutting-edge stem cell techniques to understand the diseases that cause dementia and search for potential new drugs. Stem cells are cells that have the potential to become any other cell in the body. This Nobel prize-winning technique takes skin cells donated by people with diseases like Alzheimer’s and winds back their clock to produce stem cells that can then be turned into working nerve cells in the laboratory. It’s far from being as easy as it sounds but there are many initiatives now underway to create ‘banks’ of stem cells made from samples donated by people with different forms of dementia. These cells are also proving to be a fast and effective way to screen thousands of potential compounds to shortlist the most promising candidates for new treatments – work currently underway at our Stem Cell Research Centre. 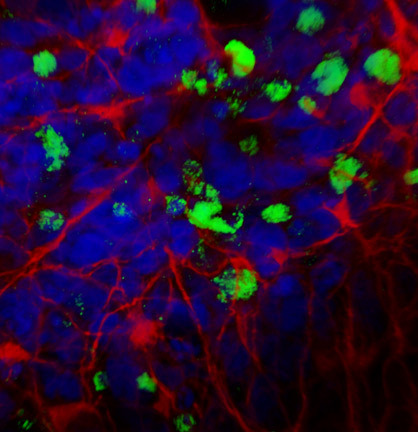 Nerve cells created from skin cells from a person with Alzheimer’s showing the build-up of hallmark Alzheimer’s protein, amyloid, in green (Courtesy of Dr Rick Livesey, Gurdon Institute, University of Cambridge). Studies in mice are another important part of the drug discovery process, as they allow potential new treatments to be tested in a living organism. We also heard from several researchers whose research programmes use mice bred to develop particular features of diseases like Alzheimer’s. Prof Giovanna Mallucci from the University of Cambridge used her time on the conference platform to highlight some common processes that go wrong in several different neurodegenerative diseases. She’s previously published promising findings in this area which raise the promise that one drug targeting such a common mechanism could hold benefits for multiple forms of dementia. It’s very encouraging to see so many varied approaches being studied to develop new treatments for dementia. 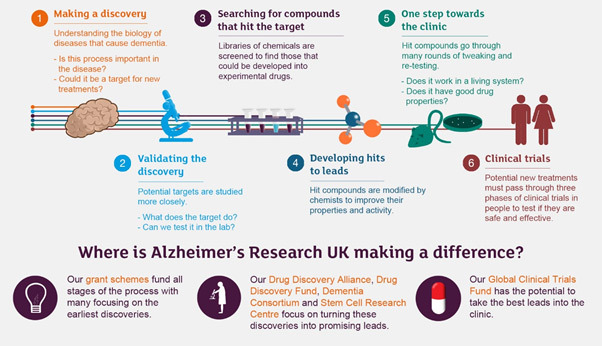 The Chief Scientific Officers of our Drug Discovery Alliance told the packed room how the three Alzheimer’s Research UK Drug Discovery Institutes will be dedicated to working with researchers to move their promising ideas through early-stage drug discovery. We’re recruiting up to 90 new drug discovery experts who will work in the three Institutes at the Universities of Oxford, Cambridge and UCL. As well as our Dementia Consortium – a partnership project that is already supporting three exciting drug discovery projects across the world – we also have a fund dedicated to enabling clinical trials of new treatments. This includes not only new experimental drugs but testing existing drugs already available for other diseases, and non-drug approaches to treatment. We’ll keep you updated with breaking developments from across dementia research on the blog. We really liked this dementia related blog so have added parts of it and a link back to it from our page on http://www.ukcareguide.co.uk. If you have any questions, please do get in touch. Otherwise. also fee free to link back to our library of dementia blogs if you think it would be useful.